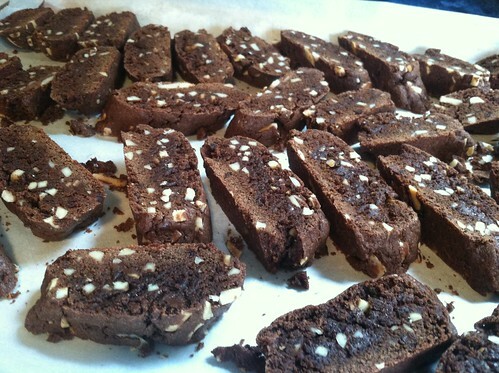 Christmas Notebook » brownie biscotti…sooo good! 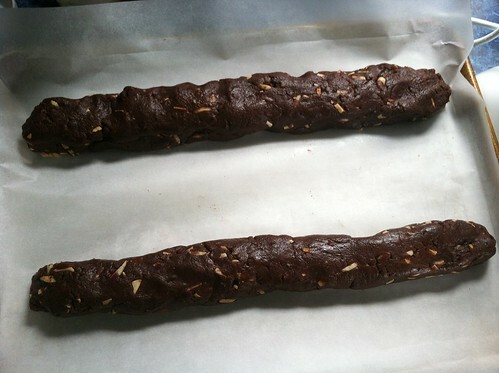 Today I made Toffee Bar Crunch Biscotti and Brownie Biscotti. We have company coming this evening and other company stopping by Saturday. I’ll be serving these both times. The leftovers will be frozen for Christmas. 4 oz. 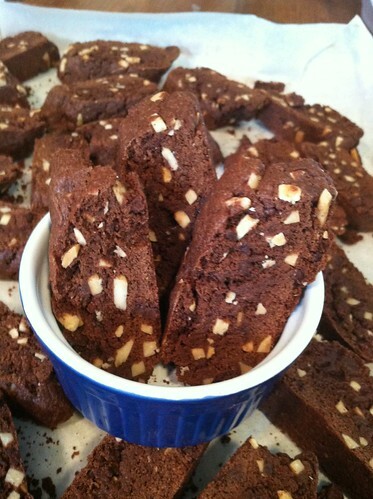 almond bark or white chocolate for drizzling over the biscotti when done. Toast the almonds in a frying pan over medium heat for 3-5 minutes, stirring now and then to prevent burning. Pour into a bowl and set aside to cool. In a mixing bowl, combine the butter, eggs and vanilla until well blended. Combine the flour, sugar, cocoa, baking powder, baking soda and salt; gradually add to butter mixture just until combined (dough will be crumbly). Add the cooled almonds and the chocolate chips. Mix just until combined. Line a baking sheet with parchment paper and flour it lightly. Turn dough onto the baking sheet. Divide dough in half. Shape each portion into a long thin log, leaving 3 in. between the logs. Mine were about 13-14″ long and a couple of inches wide. Bake at 325° for 30-35 minutes or until set and tops are cracked. Cool for 15 minutes. After cooled for 15 minutes, leave on the baking sheet; cut diagonally with a serrated knife into 1/2-in. slices. Turn them with cut sides down. Bake for 20-25 minutes or until firm and dry. Remove to wire racks to cool. For a drizzle, melt almond bark in the microwave at 50% power for 1 minute; stir. If needed, microwave an additional 10-20 seconds, stirring until smooth. 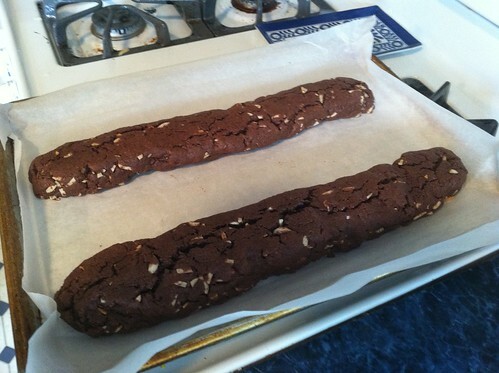 Drizzle over biscotti. Yield: 3 dozen. Freezes very well. If freezing, I don’t drizzle it until I’ve taken it out of the freezer and it has thawed. 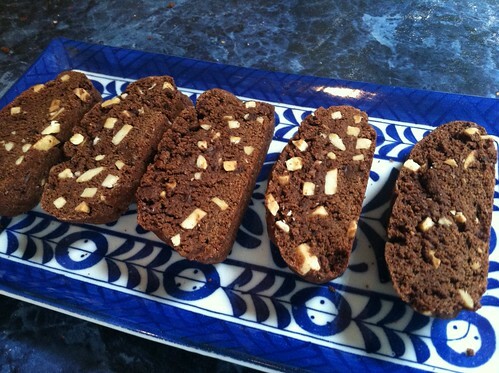 Biscotti makes a great gift. So good with coffee! This entry was written by ~~Rhonda, posted on October 2, 2012 at 7:46 pm, filed under cooking. Bookmark the permalink. Follow any comments here with the RSS feed for this post. Post a comment or leave a trackback: Trackback URL. 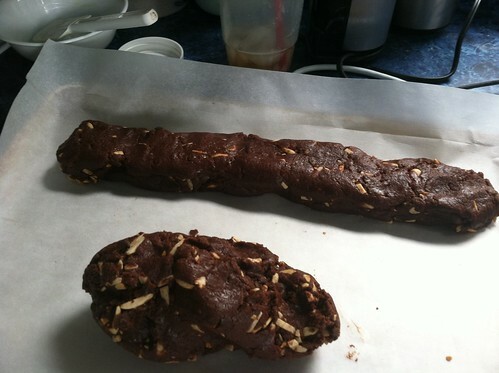 That biscotti looks soo good!I have never made it before,I might give it a try this year!